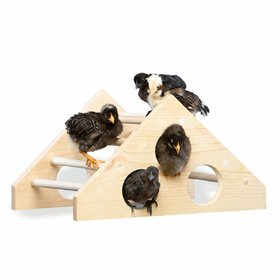 Chicks enjoying their Jungle Gym! 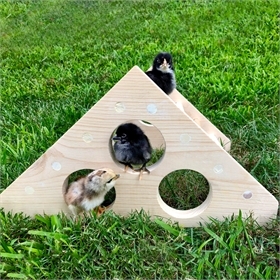 The Chick Jungle Gym is designed to encourage chickens' natural instinct to roost. Recommended for chicks one week to eight weeks old, the holes in the side offer extra roosting space and a way to "escape" should they stumble or fall underneath. 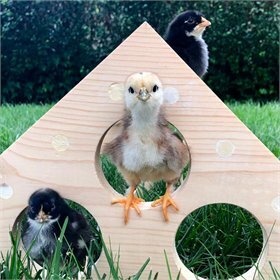 We found some of our chicks really like to hop through and sleep in those holes, too. 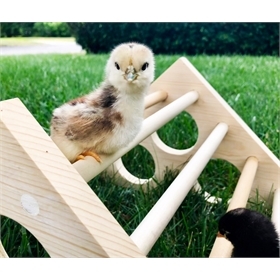 And if you have a chick getting bullied, the Chick Jungle Gym may give her a great way to hide from the aggressor! 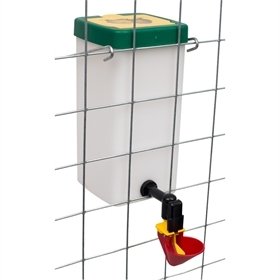 Position your Chick Jungle Gym far enough away from your heat source that you don't have to worry about it overheating (and always use safer heaters like these), and also far enough away from your brooder walls that chicks can easily get around it. Play around with positioning for maximum comfort and enjoyment of your brood. Measures approximately 9"h x 16"w x 13" deep when fully assembled. 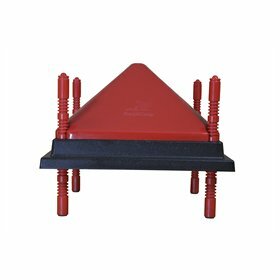 The kit includes: (2) pre-drilled side panels, (8) 5/8" dowel rods, (16) #6 x 1" stainless steel Phillips screws, (16) 1/2" wooden screw plugs, wood glue, and instructions.